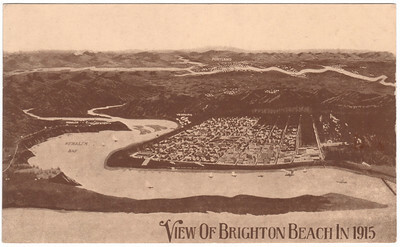 Brighton was platted in 1910 as part of the real estate boom created by expectations of railroad service from Portland. 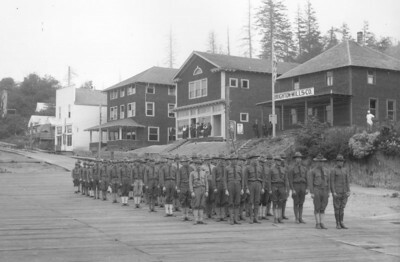 The mill proved an importand source of spruce lumber during World War One. 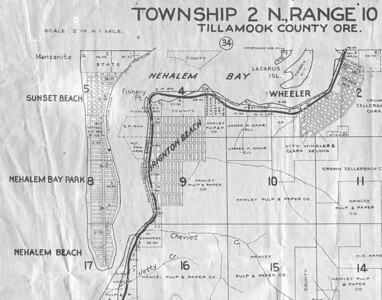 Real estate fever stimulated by the railroad connecting Portland to Tillamook infected everyone along the line. 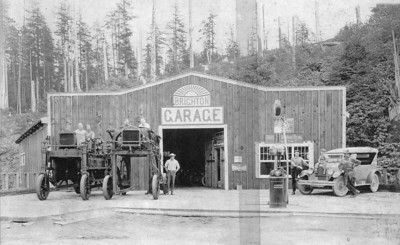 Gasoline as well as steam fueled the Brighton mill. 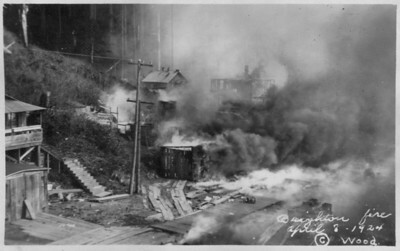 Many of the houses at Brighton burned in 1924. 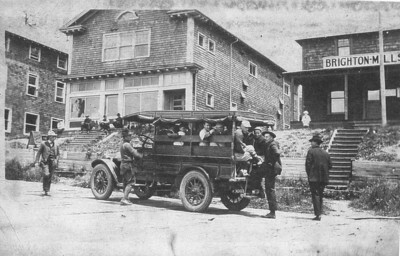 Brighton took its place as a developer's dream along with hundreds of lots platted on the Nehalem spit across the bay. Saturday night, let's head for town. After the fire, almost everybody moved away. 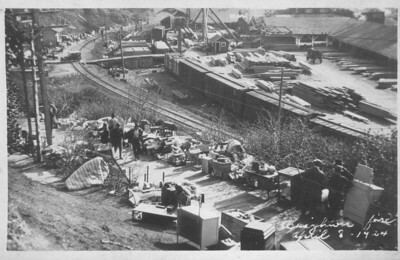 Just a few years after rail service began, the Brighton spruce mill hit full production. 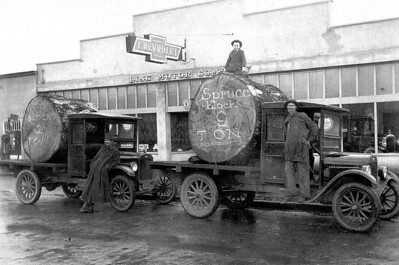 During World War One, soldiers operated many spruce mills in Oregon and Washington to produce structural wood for airplanes. 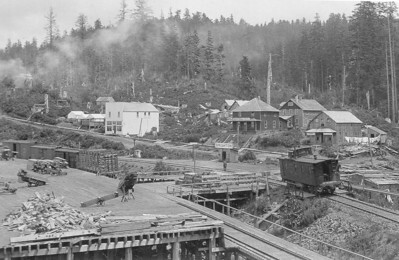 Railroad tracks ran adjacent to the mill as they did for mills in Wheeler, Garibaldi and Tillamook. 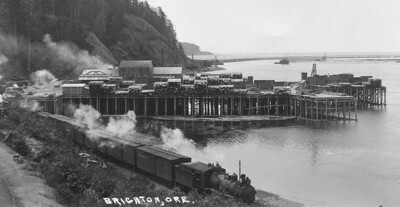 The rails brought logs from the forests and took lumber to Portland. 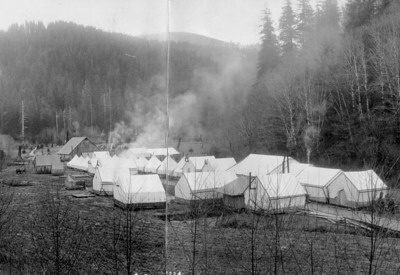 Spruce soldiers lived in camps such as this one along the Miami River. 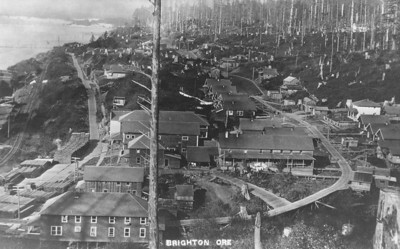 As with most logging and lumber operations, Brighton provided housing for workers. Auto dealers competed to determine which brand of vehicle could carry the most weight.